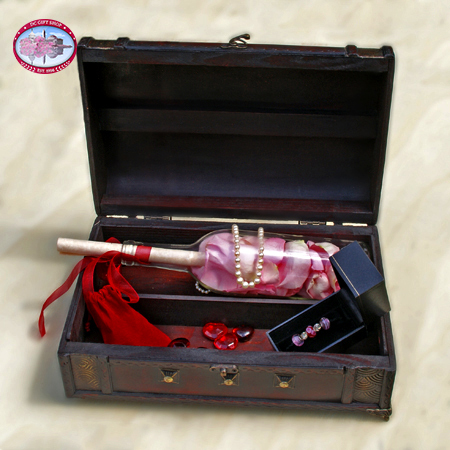 This Mother's Day give her a Treasure chest complete with a customized message in a bottle filled with real, long-stem pink rose petals and tied off with a red sheer ribbon. Treasure chest also includes a Chrysalis charm bracelet and a 16-inch strand of cultured fresh water pearls. Mother's Day message is printed on parchment paper in an elegant script font. The chest is made of wood and comes with a bag of baubles for a nice finishing touch.Use our Mother's Day Poem or create your own personalized message in the comment field during your checkout. You are the truest friend I have When trials, heavy and sudden, fall upon me You are always there to bring peace to my heart.Thank you for all the things you have doneHappy Mother's Day!